The Arndilly herd started inauspiciously with a heifer purchased at a rare Breeds sale at Stoneleigh in 1993. 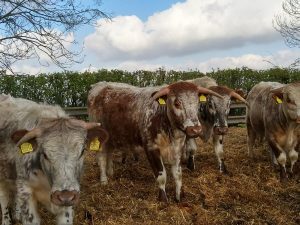 Inspired and mentored by Charlie Sutcliffe, the Longhorn breeder of the Tetford herd, the Graingers went on to buy more Longhorns and a bull ‘Bluestone Amourer’ bred by Charlie’s son. Pauline Grainger explains the breed was chosen for its docility; being a pleasure to work with, easy calving, produce plenty of good quality milk for their calves, are excellent mother’s and a delight to the eye. 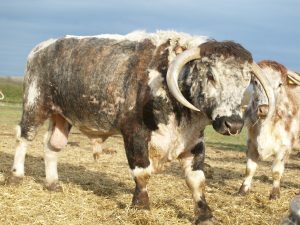 She has managed the Longhorn’s single handed and who live outside all year round, a testimony to their good nature. They require minimal intervention or veterinary attention or medication with only worming, fluke treatments and fly control adopted. A bull ‘Newton Santa’s Little Helper’ a Blackbrook was purchased 2010 from the David & Graham Walker to put colour into the herd, improve feet and locomotion and has a number of daughters now offered. The current stock bull is ‘Arndilly Gun Beetle’, home bred, who has produced many good quality calves. 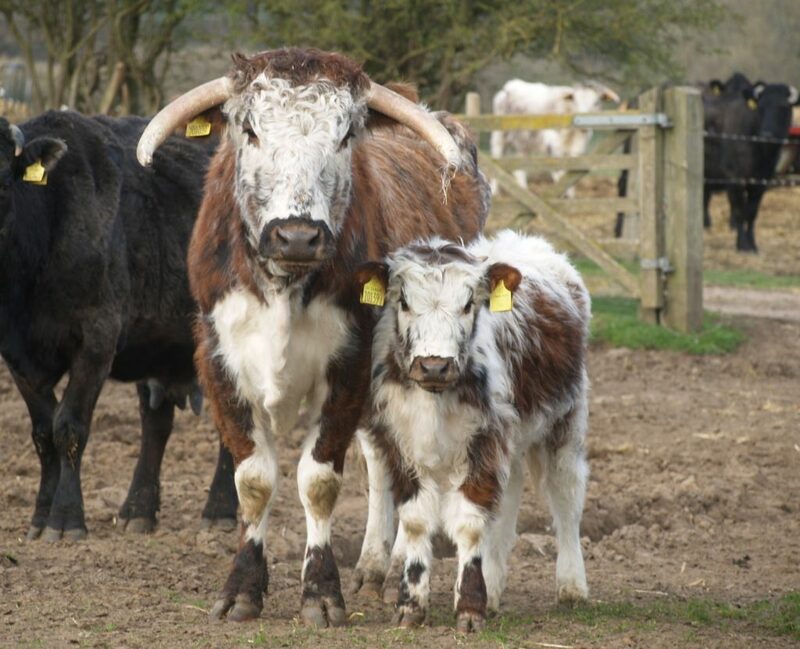 There are also notable genes in the herd from Blackbrook, Fishwick, Rousham, Huntsham & Tetford families to name a few. 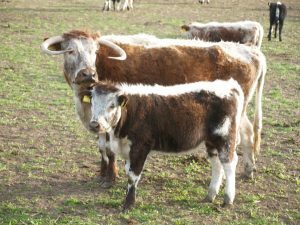 Apart from the pedigrees, the crossbred Longhorns make good commercial cows, are good mothers easy calving, and also have plenty of milk. The cattle have lived extensively at grass, overwintered outside on minimal grass cover after last year’s drought with straw and only recently silage and have plenty of hair and will undoubtedly furnish and thrive. It is anticipated PD results can be secured before the sale as a guide but calving has been year round and all cows run with the bull to date. The herd has been closed for a number of years other than buying in stock bulls. It is considered to have a high health status with blood tests clear previously for IBR, Lepto, Johnes. The calves have been tag tested in previous years for BVD and were all clear. The Arndilly herd is in a four year TB area, the last test being in November 2018.